What makes the week of a VIP like Luis Manzano complete? The answer is "A," also known as Smart Prepaid's All-In 99 that offers calls, texts, mobile internet and Facebook valid for one whole week! There’s nothing like starting your week well aware that you have all the bases covered for your active mobile lifestyle: from texts to all friends, calls to loved ones, ready online access, right down to an uninterrupted stream of Facebook updates. 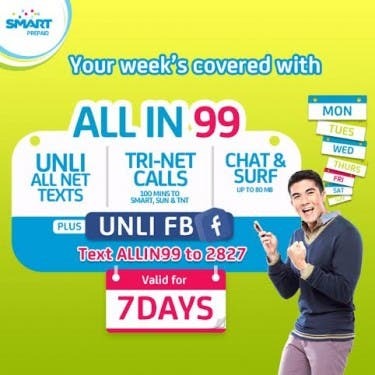 Luis Manzano revealed via his new TVC that mobile services leader Smart Communications Inc. gives you all the above-mentioned daily necessities with its new offering for prepaid subscribers: the Smart Prepaid All-In 99. For just PhP 99, Smart Prepaid All-In 99 provides an unbeatable combination of unlimited texts to all networks; 100 minutes of calls to Smart, Sun and Talk ‘N Text; mobile data of up to 80 MB; and unlimited access to the popular social networking site, Facebook – all valid for seven days. With more than enough ways to communicate with your loved ones from Monday to Sunday, there’s just no way you’ll be out of touch – and all for an effective rate of only PHP14 a day. “With Smart Prepaid All-In 99, our subscribers will no longer have to ponder and key in codes on a daily basis because all their concerns – from calls and texts to mobile internet and Facebook – are now covered for one whole week,” said Joel Lumanlan, Smart Prepaid business head. 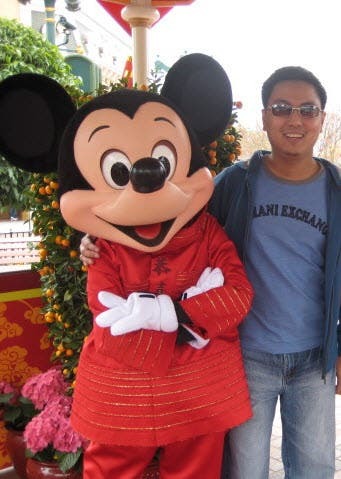 “It’s a one-size-fits-all promo for all prepaid subscribers so they may go through the rest of week without worrying a thing about staying in touch with their social circles,” he added. With Smart Prepaid All-In 99, you may easily text all your friends for days on end to plan the next outing, and make the mandatory ‘good morning’ and ‘good night’ calls to your special someone each day of the week. You also conveniently stay in the loop with your contacts on Twitter, Instagram, Line or Viber using the 80 MB data allocation, or use it to search for stuff on Google and Yahoo, or just access your favorite websites. And with unlimited Facebook access for the whole week, you will not miss out the latest happenings on your newsfeed – be it a birthday notice for a buddy, a hilarious meme or a viral online video. “The Smart Prepaid All-In 99 covers all the communication needs of our socially-engaged prepaid subscribers at an incredibly low price, allowing them to get the most value for their money,” said Evelyn Jimenez, Prepaid Marketing Group Head. To enjoy Smart Prepaid All-In 99, Smart Prepaid subscribers may simply text ALL IN99 to 2827. For more information about this great new offer, visit www.smart.com.ph/prepaid/offers/allin99. Get updated with the latest offers. Visit www.smart.com.ph regularly or follow Smart’s official accounts on Facebook (https://www.facebook.com/SmartCommunications) and Twitter (https://twitter.com/SMARTCares).